Spent grains constitute the leftover malt and adjuncts that remain after the brewer has extracted sugars, proteins, and nutrients from the mash. These materials can comprise as much as eighty-five percent of a brewery’s total waste by-products, which is why putting them to use again is such a priority for breweries. While the uses for spent grain are many and multiplying, agricultural avenues continue to dominate, especially using the grains as animal feed. Indeed, most brewers have arrangements in place to give or sell their spent grains to local farmers – who readily use these cheap and nutritious leftovers to sustain their livestock. It’s a wonderfully symbiotic and sustainable relationship. Yet, these relationships are not new. They were quite ordinary in the late nineteenth century at the height of our nation’s last brewing revolution. Faced with significant competition and market saturation, breweries throughout the country sought to increase profits in any way possible. One of the most common practices was to shelter dairy cows at or near the brewery and then sell the milk to the general public. The milk produced by these distillery dairies, however, became the target of public health campaigns around the United States between the 1850s and the 1910s. These often decades-long crusades directly targeted the breweries’ practice of making and selling this “swill milk” – the name given to the substance produced by feeding dairy cows little but hot, wet spent grains and distillery slop. Swill milk was often adulterated with plaster of Paris to take away the blueness, starch and eggs to thicken it, and molasses to give it the buttercup hue of honest milk. First linked with danger in the late 1830s, swill milk was the product of urbanization, commercial industrialization, and shrinking profit margins. As American cities grew, available pasture land and grazing areas – like Boston’s Common which foddered cows until the 1850s – gave way to expanded housing and business districts, forcing dairy cows and other livestock into confined stables, family outbuildings, or removed far outside the city to the rural countryside. This created a unique set of problems for the delivery of fresh milk. The chemical and bacteriological composition of raw milk resulted in its spoiling quite easily, often in a matter of hours – and even faster during the hot summer months. Before widespread refrigeration and rapid rail or truck transportation, this meant milk had to be obtained quickly and within a relatively short distance from its original source to assure the best possible quality. These circumstances sent urban dairy farmers in search of a cheap and abundant food source. They found it in the leftover mash of the brewing and distillation process – a massive and essentially worthless waste product of which slumping urban breweries were all too happy to rid themselves. Brewers and distillers either rented stable space to individuals or owned the dairy herds directly. They fed them almost nothing but hot, wet spent grains, and rarely – if ever – sent the animals out to exercise or graze on natural grasses. The grains were actually quite nutritious; but when fed in such large quantities, hot and straight from the still, the excess growth and increased milk production seen among the cattle often served to mask serious health problems. 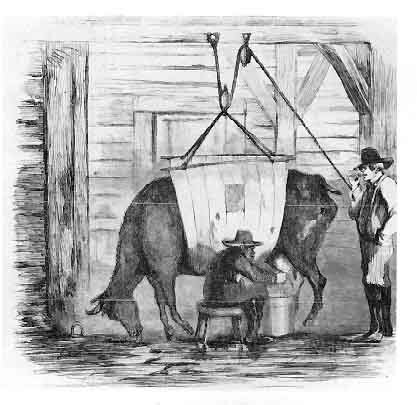 When combined with high rates of adulteration and a general lack of sterility in distillery dairies, the swill milk system was not necessarily a healthy one for cow or consumer. The distillery dairy system was often harmful to both cow and consumer. Physicians and public health advocates quickly charged that the final product of this agro-industrial venture was a dangerously filthy, comparatively thin, bluish colored milk that was laden with harmful properties. They further argued that it posed one of the most serious health threats to any city’s inhabitants, and especially its children. 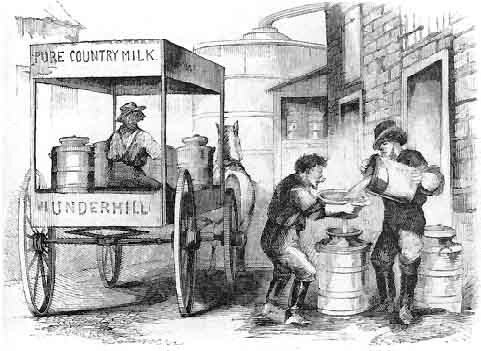 In prominent brewing cities like Cincinnati, Ohio – one of the nation’s fastest growing and largest cities for most of the nineteenth century – the urban milk problem was one of critical importance. For more than seven decades, sanitary health reformers and medical doctors in the “Queen City of the West” worked to end the sale and production of adulterated and contaminated forms of milk that persistently plagued the city from 1850 to 1920. Their campaign for safe milk began as a concerted public health protest against the city’s distillery dairies and the swill milk they produced. Pure milk advocates in Cincinnati also drew a great deal of information and inspiration from the research and tactics of New York city reformers, demonstrating the movement’s national development. Both cities, like others across the country, passed a number of far reaching ordinances aimed at regulating the production and sale of milk as well as the conditions of urban dairies. In response to the persistence of distillery dairies into the 1880s, Cincinnati health officials expanded their efforts to broader issues of contamination beyond regulating feeding spent grains and dairy conditions. They pushed for more offices, enlarged staffs, and bigger budgets for milk inspectors as well as new technologies for detecting adulterations – all while attempting to craft legislation that could codify a scientifically defined standard for safe milk. Nevertheless, allegations of political corruption were common around the country, complicating the swill milk debate by putting physicians and officials from the health departments in direct confrontation with each other. Despite generalized successes, Cincinnati officials continued to fail on the central issue of bringing an end to the city’s distillery dairies into the 1890s. Allegations of political corruption went hand-in-hand with the persistence of swill milk. By the turn of the century urban milk campaigns around the country culminated with the localized implementation of nationwide scientific solutions. Cincinnati’s efforts become particularly intense during a two-year period between 1906 and 1908 when a group of doctors launched a renewed and concerted campaign against swill milk and its sources. During this period, the city’s own Dr. Otto P. Geier helped organize the National Association of Medical Milk Commissions which aimed to offer assistance to health reformers waging clean milk battles in cities across the country. This movement was an extension of Dr. Henry L. Coit’s “certified milk” campaign that began fourteen years earlier in New Jersey. Coit’s not-for-profit enterprise sought to provide pure milk for clinical purposes by checking samples and certifying the contents as safe. At the same time, increasing numbers of physicians around the country called for the mandatory pasteurization of all milk, regardless of origin. These two movements were by no means mutually exclusive. There were many that felt certified milk was best solution, but that pasteurizing offered the best stop-gap measure for preventing sickness and death until greater quantities of pure certified milk could be obtained at reasonable prices. Finally, the onset of federal prohibition of alcohol in 1920 helped bring an end to any remaining distillery dairies. To be clear, the issue was not the use of spent grains as feed, but rather the mode and method of feeding. Spent grains are represent a cheap, nutritious, and otherwise sustainable way to feed animals. Breweries today do not feed cows directly from their stills, nor do they confine dairy herds to tiny stalls with no exercise. In fact, the practice remains so entrenched that both farmers and brewers alike spoke out fervently against a 2014 ruling from the FDA that threatened the current widespread use of spent grains as livestock feed. In quick response, the FDA has clarified the ruling, stating that small breweries could be exempt from the rule, that it would not require breweries to dry and pack spent grains, and that it does not know of any instances of any food-borne illness resulting from spent grain. Here’s hoping this means the craft beer revolution is here to stay. Cheers to more beer and more spent grain! 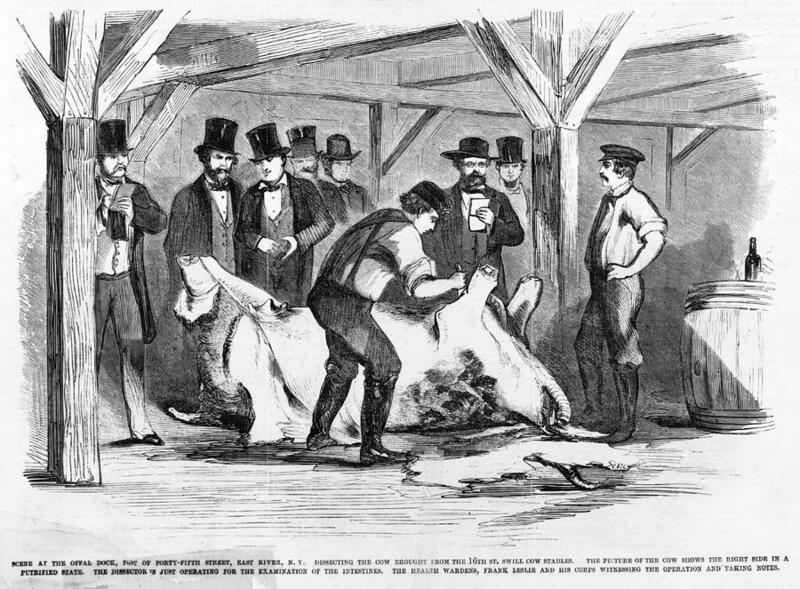 Adam Rathge at Points Blog has a fascinating post about the nineteenth century practice in the United States of housing milk cows at breweries and distilleries. Cows were brought into breweries and distilleries to take advantage of the leftover spent grains from the fermentation process. These grains are incredibly nutritious and they would be fed to milk cows. The grains were in fact so nutritious that they permitted the dairies to engage unsafe practices without reducing milk production. Eventually, the unsafe practices led to a nationwide effort to close the dairies housed within breweries. Unfortunately, the use of spent grains was unfairly equated with unsafe milk and the practice went out of fashion. Today, the growth of craft brew movement has led to an increase in the reuse of spent grains for dairy production. Fortunately, spent grains are no longer tainted by their association with unsafe milk.